Chartered in 1711, Beaufort is South Carolina’s second oldest town after Charleston and its best kept travel secret…not for long! The picturesque downtown area is on the National Register of Historic Places, with more antebellum homes per block than any other American town. Check this post for fun and free things to do with kids while in the area. I’ll let the photos do the talking. Have a wonderful vacation in Beaufort South Carolina! Stay at Ocean Creek Resort, an all inclusive and reasonable priced resort; secluded oasis on 57 beautifully landscaped acres and yet close to awesome Barefoot Landing and the Alligator Adventure attractions. It has excellent amenities (pools galore, tennis courts, golf, private beach access, restaurant). If you’re looking for something to do with your family that’s affordable, educational, memorable and fulfilling then visit Brookgreen Gardens a National Historic Landmark with the world’s most significant collection of outdoor American sculptures and the only accredited zoo on the South Carolina coast. However if you’re more an adrenaline pumping kind of person then go to Ripley’s Aquarium inside Broadway at the Beach. For about $20 ($10 for kids 6 to 11, and $4 for those 2 to 5) you can say Hello! to 15 foot Sharks pet feisty stingrays, and if you hurry up before the year’s end, can even “shake hands” with Blackbeard, the most ruthless pirate in the Caribbean known to man! Winter is so peaceful on the South Carolina beaches. 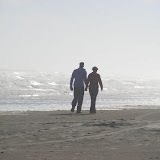 Love at first sight on my first visit to Folly Beach, just a 15 minutes drive from downtown Charleston. Have all year round fun at the beautiful Carolina beaches! Isle of Palms a more family oriented beach close to Isle of Palms County Park and its awesome zip-line equipped playground. Also nearby are historic Fort Moultrie and USS Yorktown aircarft carrier. Fort Moultrie: visit heroic Revolutionary War battles, ingenious Palmetto trees defense system, intriguing WWII radio communication and photo incredible vistas of the Ravenel bridge. Self guided tour of Charleston’s most outrageous murders, famous ghost sightings and unsolved mysteries. Sunset poetry in motion. Only at the Carolina beaches. Shot this video at the Ocean Creek Resort in north Myrtle Beach located near Barefoot Landing attractions and shopping area. Peace at every step in beautiful South Carolina!